In August 2018, the state government approved drafting of the Water Resources Management Bill. The government is committed to consulting on the Bill development and will discuss progress as well as refining drafting approaches with stakeholders as and when they become available. In Western Australia, all natural water resources are vested in the Crown. Water resources are currently managed under six different Acts. These Acts regulate the take and use of water, protect waterways, manage drainage and protect public drinking water sources and supply. 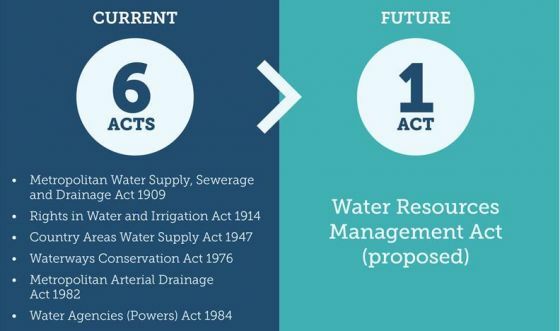 We are proposing to consolidate the six existing Acts into one modernised Water Resources Management Act.